A couple weeks ago, I shared the crazy night time routine of our chickens, so this week I thought I'd show you how the guineas prepare for bed. There is definitely less squabbling and fussing in the guineas' night time routine. Instead of roosting inside a coop (which we tried to get them to do with no success), they roost high in a tree right beside the coop. It's kind of funny how some of them get up into the tree. Guineas can fly amazingly well, so some just fly straight up from the ground. Others like to take a tiered approach and jump up on the chicken run, then onto the metal carport, then into the tree. Once they are up in the tree, they shuffle a bit to find a good branch, but it's typically pretty uneventful. However, when it starts to get dark, they do get loud and chirp quite a bit. My theory is that they are just talking to each other to make sure everyone is safe in the tree. Or maybe it's just because they like to make noise! Thought I would also share this video of a scuffle I caught while I was waiting for them to head to bed. It was so funny how two of them were sparring and all the others were standing around egging them on (kind of like a schoolyard fight!). I was going to intervene, but it was over as soon as it started and was mild compared to other tiffs I've seen. Never a dull moment with these animals. Between the chickens and guineas we have plenty of entertainment out here! We've never had guineas before. They look just as fun as chickens! So amusing! 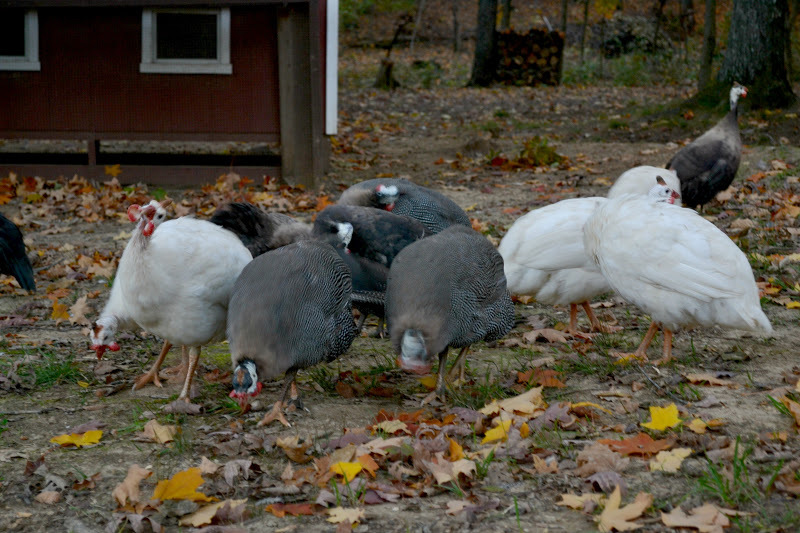 We have guineas in our neighborhood and love seeing their antics. Your photography is wonderful. And I'm going to have to try that sweet potato chili! The videos, in particular, are great, Tammy. Thanks for sharing! Regards, Farmer Doug @ Ladybug's Mew in Yellow Point. That was amazing to watch. They are quite good flyers. I love seeing the video - have a wonderful weekend Tammy. I never realized guineas could fly. I feel like they should've been wearing leather jackets, smoking cigs, living in the '50s and waving switchblades at each other. Wow I loved the video of them in the tree that is what I have seen wild turkey's do here back in the bush very smart and cool. That's pretty funny. You must see and hear lots of interesting things! I can only imagine! We used to have guineas a long time ago & I remember them being excellent 'watch dogs' for anything that came close to the house at night, they'd let you know immediately! I hadn't thought about writing about my hens. They are so funny sometimes. Thanks for visiting my blog and leaving a sweet note! Have a nice weekend! Tammy, couldn't resist sharing this on my facebook page and featuring you this week on tomorrow's hop. I am a bit in love with your guineas!